Julie has studied Art History, the Visual Arts and Interior Decorating. 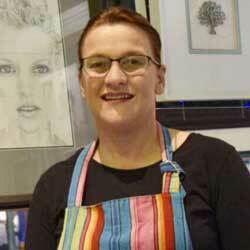 After Nursing for 23 years Julie has returned to her passion of art, colour and design. A mother of three children and running a business, life is very exciting. Margaret has spent many years immersed in cross-stitch, patchwork and arts and crafts. She began working at In The Picture 15 years ago and has the most incredible eye for colour and design, along with a great ability to connect with people of all ages and backgrounds. It still and always will, amaze the other team members, how Margaret remembers nearly every customer she’s served by their first name. She has recently reduced her days, (once working as the store manager) so she can spend some more time with friends and her first grandchild – Will. Margaret has spent many years immersed in cross-stitch, patchwork and arts and crafts. 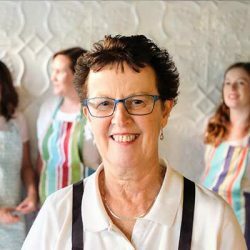 She began working at In The Picture 15 years ago and has the most incredible eye for colour and design, along with a great ability to connect with people of all ages and backgrounds. She has recently reduced her days, (once working as the store manager) so she can spend some more time with her first grandchild. 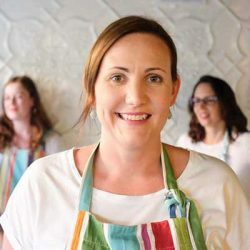 A busy Wife and Mum of 3, Bronwyn balances her time between her son, twin girls and arts and crafts when she has a little spare time. Bron spends her 3 days with us, concentrating on stretching canvases and fabrics; frame cutting and joining, as well as all 3D memorabilia and oversize framing projects. She joined our happy team almost 8 years ago.